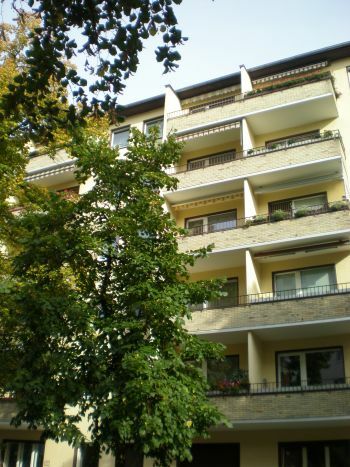 In the middle of the old city West, close to the KaDeWe, Kaiser-Wilhelm memorial church and Zoological Gardens these apartments are located in a quiet side street. You live quite central and can get to anywhere in Berlin easily because of the proximity to U-Bahn and buses. Just situated on the border of suburbs Charlottenburg, Wilmersdorf and Schöneberg the Apartments am KaDeWe provide vdery different facettes of the life of the German capital city. On the one hand, you are living close to the beautifully designed Viktoria-Luise-Platz with its fountain and elegant restaurants, on the other hand the old borgois houses of the Wilmersdorf quarter. The Prager Platz which is to the South has been recently redesigned and is offering a special atmosphere. On the other side of Spichernstraße you are in the middle of the vibrant Charlottenburg which has a lot to offer. The centre of the old West Berlin with its boulevards Kurfürstendamm and Tauentzien are in walking distance, the Pariser Straße and the Ludwigkirchstraße offer numerous small cafès and restaurants which in summer provide meditarreanean flair. The monument of World War II, the ruin of the Kaiser-Wilhelm memorial church is near by and of course the KaDeWe with the famous food court upstairs offers you a spot to relax close to home. The area also has something for children: the Zoological Garden and the Aquarium are within walking distance as well as several Movie theatres and theatres. 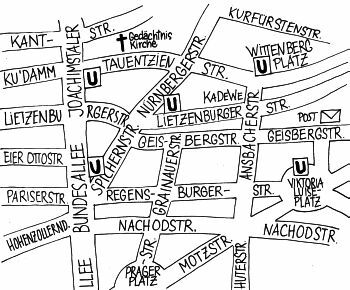 In Schöneberg on the other side you will find the Gay Area, and the reknown Winterfeldmarkt - a typical weekly market in Berlin is only a stone`s throw away. Another advantage is the good location in regard to public transport. The U-Bahn -Station Spichernstrasse with lines U3 and U9 are just five minutes walk away. Without any problems you can go to anywhere in Berlin. The Dahlem galleries or the Free and Technical universities or University of the Arts are close by, but you can easily travel to the New National Gallery, the concert hall Philharmonie or to the Eastern part of the city with the historical buildings, the museums island and the coolest squares and streets with the hippest bars and cafes and pubs and clubs. A few theaters (cabaret "Bar Jeder Vernunft", Vagantenbühne, musical theatre Theater des Westens, Berliner Festspiele) as well as cinemas, small galleries and shops of all kinds and restaurants of numerous nationalities are all in walking distance. A wine shop that offers small tapas dishes and acultural program is basically just next door. The Dachgartensauna (roof garden sauna) in the Europa-Center, a Fitness Studio at the newly designed Prager Platz with a few shops and cafés or the cosy cafés in Pariser Straße and around Ludwigkirchplatz are rounding off the many offers that this area has. The Apartments am KaDeWe provide you despite all these activities with a quiet focal point in a vivid city. The tranquil atmosphere will make recovering from sight-seeing and work very easy.